Saudi Arabia and its crockery-breaking heir apparent, Crown Prince Mohammed bin Salman, are, once again, opening up claims of advancing a more progressive future for the kingdom to doubt. Faced with criticism from Canada over the treatment of two prominent human rights activists, Saudi rulers on Monday did the kind of thing that backward, insecure despots often do — they lashed out and penalized their critics. Riyadh expelled the Canadian ambassador and announced a freeze on all new business with Canada, which counts Saudi Arabia as its second-largest export market in the Middle East. The Saudis also said the kingdom would withdraw from Canada the approximately 12,000 Saudi students on government-funded scholarships and family members and transfer them to other countries. [T]his Saudi retribution is unnecessarily aggressive and clearly intended to intimidate critics into silence. It’s the kind of move that, in the past, would have immediately elicited a firm, unified opposition from the West. So far, there’s hardly been even a whimper of protest. Canada ran afoul of the Saudis when its foreign ministry called for the release of the women’s rights activist Samar Badawi, who was arrested last week, and her brother, Raif Badawi, who is in prison for running a website that criticized Saudi Arabia’s religious establishment. In 2013, Mr. Badawi was sentenced to 1,000 lashes with a cane, 10 years in prison and a large fine for administering the site. He received the first 50 lashes in 2015, but his punishment was suspended, at least temporarily, after a video of the lashings drew international outrage. Saudi Arabia has offered no explanation for why Ms. Badawi, whose activist-lawyer former husband is also in jail, was detained. But she has long campaigned against the kingdom’s guardianship laws, which prevent women from traveling abroad or obtaining certain medical procedures without the consent of a male relative. The Saudis claim that the Canadian statement is “an overt and blatant interference” in its internal affairs, but that argument is specious. Mr. Badawi’s wife, Ensaf Haidar, and their three children have political asylum in Canada, and she became a Canadian citizen last month. Saudi Arabia is a signatory of the [United Nations Charter and the Universal Declaration of Human Rights] Charter and a member of the United Nations Human Rights Council, whose mission is to strengthen the “promotion and protection of human rights around the globe.” Since ascending to power with his father, King Salman, in 2015, Prince Mohammed has encouraged foreign investment, granted women the right to drive, opened commercial movie theaters for the first time in 30 years and worked to soften the kingdom’s ultraconservative official school of Islam. But he also has evinced an authoritarian edge, locking up clerics, activists and businessmen. Under Prince Mohammed, the Saudis have also not been shy about speaking out about, or directly intervening in, the affairs of other countries, including Yemen, Bahrain and Qatar. On Monday, the White House refused to comment. The only reaction so far has been from a State Department official who spoke on background and equated Canada and Saudi Arabia as “both close allies,” even though only Canada is a member of NATO. Mr. Trump has previously signaled acquiescence to, if not fondness for, the kingdom’s authoritarian ways. And the American president's own attempts to bully Canada’s prime minister, Justin Trudeau, in June may make Prince Mohammed feel bolder about lashing out. The administration’s passive response also represents a chilling abandonment of two activists whose unjust treatment has been acknowledged by the United States itself: Ms. Badawi received the State Department’s Women of Courage Award in 2012 in a ceremony with Hillary Clinton and Michelle Obama, and the United States Commission on International Religious Freedom, a government agency, has a page on its website highlighting Mr. Badawi’s case. Not even two weeks ago, the State Department held a much-hyped religious freedom conference, headlined by Vice President Mike Pence, that issued a lofty statement advocating the “recognition of universal human rights and human dignity.” It’s hard to take that statement too seriously so long as the White House remains quiet about these recent developments. 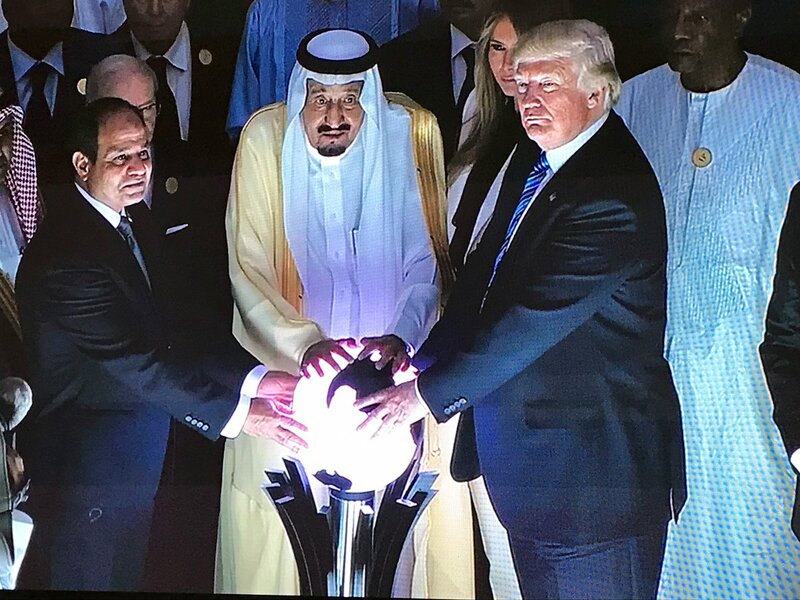 I suspect that Trump yearns to rule in a manner akin to the Saudi Price who can censor the news media and arrest and imprison his political rivals.